The sixth chapter of Our White House, “Part VI. The People’s House,” examines the presidents and events of the 1960s, beginning with the Kennedy and Johnson administrations and concluding with the resignation of President Richard Nixon. Varying perspectives provide insight into the Kennedy administration, including the campaign trail encounter of rocket scientist Homer Hickam, personal observations from the White House physician, and the story of First Lady Jacqueline Kennedy’s relationship with renowned Madeline creator Ludwig Bemelmans. 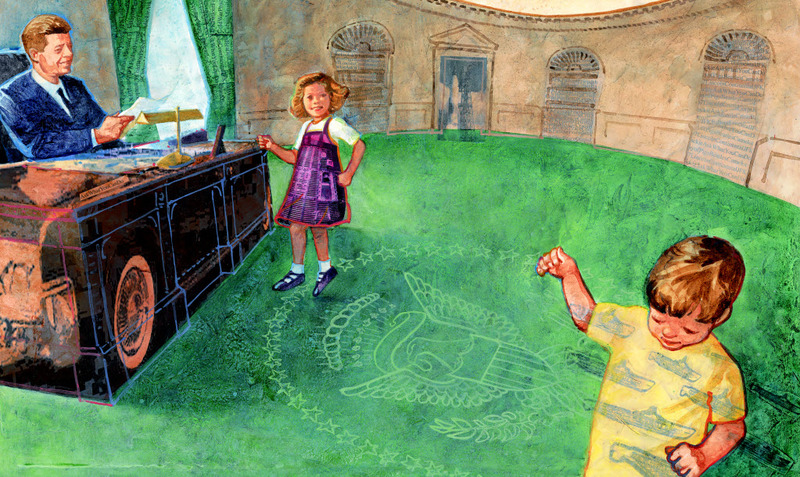 Also in Part VI, you can read presidential daughter Lynda Johnson Robb’s thoughts on her room in the White House and savor Steven Kellogg’s story and illustration of presidential pets. The words of President Nixon, including his letter of resignation and his final remarks to the White House staff, close the chapter. To print the Education Resource Guide that includes activities and discussion questions regarding the content included in Part VI of Our White House, click here. The table of contents for Part VI of Our White House is listed below. To the right of each article or illustration title, in the “Read More” column, are links to relevant, supplemental content on this website to help you expand the educational potential of the book’s contents. OUR WHITE HOUSE. Illustration © 2008 by Steve Johnson and Lou Fancher. Reproduced by permission of publisher, Candlewick Press, Somerville, MA.